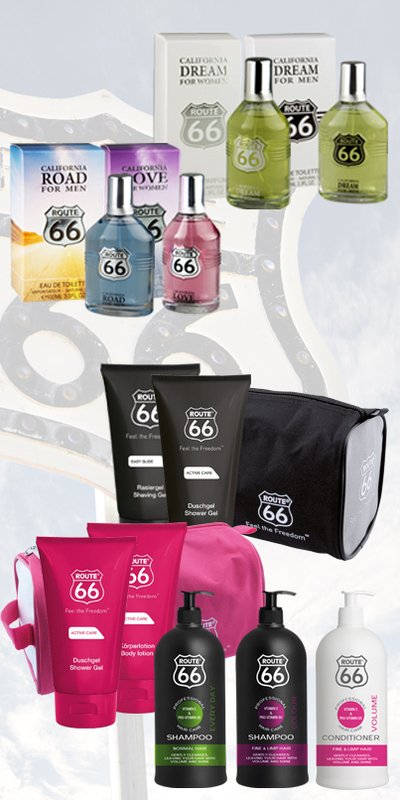 We are exten­ding our alrea­dy exis­ting varied ran­ge of “ROUTE 66” goods to inclu­de che­mist pro­duc­ts. You will start your day well‐groomed and full of ener­gy with our ran­ge of care pro­duc­ts, which con­tains show­er gel and body lotion for women and shaving gel for men. And in our “ROUTE 66 – Eau de Par­fum” and “ROUTE 66 – Eau de Toi­let­te” collec­tion you will find the right fra­gran­ce for every occa­si­on.